To celebrate World Breastfeeding Month – we are celebrating the success of our community! The theme for World Breastfeeding Month 2017 is SUSTAINING BREASTFEEDING TOGETHER! We know there is #MoreThanOneWayToBreastfeed and #MoreThanOneWayToSupportBreastfeeding! 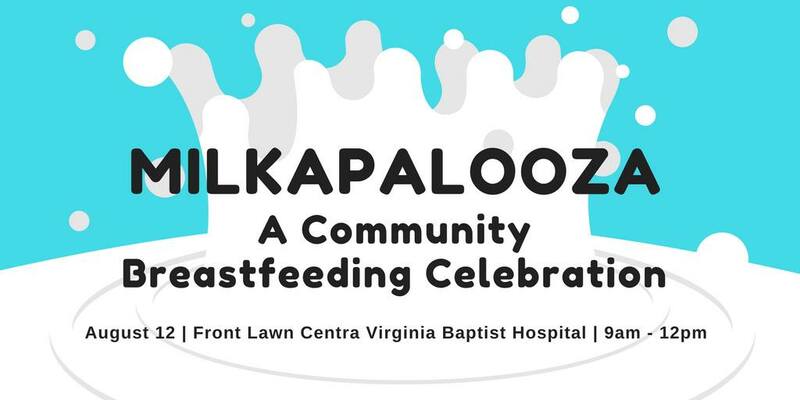 Our event 8/12/17 from 9a-noon on the front lawn at Centra Virginia Baptist Hospital will have representatives from all over our fair city who support breastfeeding! Nomad Coffee and Mama Crockett’s Cider Donuts will fill our bellies! Homestead Creamery will be there with dairy delights and a Calf Truck! Lend Me a Princess & Balloon Dude Travis will provide entertainment sponsored by F. Read Hopkins. Centra Health will have a Bounce Castle and a Arcade Truck!